LOVE TO LAUGH? VISIT CARTAGENA! What is in the name: Cartagena? each month! Home Page clients promote Cartagena, around-the-world. Cartagena LOVES Microsoft's new BING Search. Increase your Home Page's Visitors. CARTAGENA, COLOMBIA: Cartagena Airport (CTG) REAL TIME Arrivals and Departures, Hotels, Rosario Islands, Tierra Bomba and Barú, Restaurants, with current Menus and Prices, learn spanish in Cartagena, tourist attractions, Cruises, city tours, rumba en chiva, carriage rides, Weddings, money saving tips on: Buying Gold and Emeralds, Water Sports, beaches, PADI Dive facilities, Tour/travel Agencies, museums, artists, Medical/Dental, Legal, and Real Estate Professionals, Airlines, current schedules and prices. This info., and more, is readily available from our Pull Down Menu! For a single page overview, scan the Site Map. Accommodations range from luxurious 5 Star Hotels, right on the warm waters of the Caribbean, to Colombia's “Up Scale”, Bed and Breakfast lodging, located in Historic Colonial Centro or Getsemani. For individuals, large families, or tour groups there are medium price Hotels, low cost Hostals, or even Apartments to consider. Make your reservations direct with E-Mail, or if you prefer, get expert advice and help from a qualified Cartagena Travel Agency. When dealing direct with Cartagena businesses you can often find just what your looking for, and at better prices, than international bucket shop websites,and... your doing your best when you help our local Cartagena economy... THANKS from CartagenaInfo! Cartagena, Colombia, steeped in: History, Romance, Fun, and Gentle People! Every day, world leaders, entertainers, VIP’s and their families, play, do business, and live the good life in this SAFE, clean, Caribbean Jewel. Need a Rolls Royce with Bi-lingual chauffer, Rental: Car, Van or SUV, or single source transportation for up to 1,000 passengers in air conditioned chauffer driven cars, vans, or busses? The Guide To Cartagena is up-to-date, with more than 1,100 pages and 4,700 Links to help you quickly navigate as you Discover Cartagena, Colombia. The Guide helps you follow the vacation advice of world travel expert, Arthur Frommer: "read ahead". Now, with more than 1,400 photos, you can also: "look ahead". Use your E-Mail for reservations, comments, and questions. 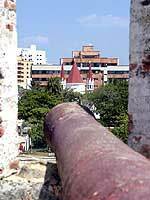 Our Cartagena businesses and attractions enjoy hearing from you. For FUN, ROMANCE or just RELAXING, The Guide will help make every Cartagena moment-extra specia! Retired? Student, or Backpacker? How does less than: $10 a day (Today is: and this is NOT a typo), including hotel, and restaurant food sound? Where else in the Caribbean can you fly direct from Miami in a little over two hours, catch a cab to your hotel for $3 u.s., dine first class for less than $15 p.p., and stay in a fine hotel for less than $30? For fun, romance, history, nightlife, great prices, AND the beautiful, warm tropics of the Caribbean, you deserve Cartagena! And, for the more active and young-at-heart, there are: Health, Beauty/Workout Spas? Colombian Paso Fino Horse show, Windsurfing, PADI Diving, Snorkeling, visit the open water Aquarium, or island hop through the beautiful and pristine Rosarios Islands? Cartagena has it all! All Home Pages load fast, contain current prices, and have E-Mail. (We respect your time.) Your questions, comments or reservation are only a quick E-mail away and available with all Home Pages. Many Cartagenaros speak English and nearly all will try, so use your English, Spanglish, Spanish, or whatever suits you best. Visitors often return to Cartagena to learn Spanish. Check out the Spanish Schools offering group, or 1-on-1 lessons, at bargain prices. Cartagena on the Caribbean, HAS IT ALL, and The Guide SHOWS IT ALL. Honor our Home Page clients with your business: In addition to promoting their businesses direct-to-you with current information and prices, these progressive business owners and managers are also helping support our work in promoting this great UNICEF World Heritage City of Cartagena, which of course, is the real reason for your visit! 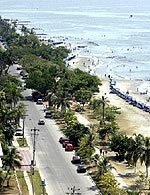 If you've visited Cartagena and have helpful tips or comments. Pass them along to others who may be considering: a vacation, convention, elective medical/dental work (save 60-70%! ), investing, retiring, or getting married in Cartagena, post a note on our Bulletin Board. There are many who would enjoy reading your comments. Thanks! Our wish for you in this troubled world: No matter where you live, we wish that it be as: Fun-Filled, Interesting, Romantic, Economical, and Peaceful as, Cartagena on The Caribbean. Come see for yourself! The Lower the Latitude, the Better my Attitude! If any Home Page advertiser in The Guide failed to meet your expectations, please send us an E-Mail detailing your experience. We will pass your comments along, and if you ask, we will do our best to act as an intermediary, and hopefully resolve your concern.